American Bladdernut, Staphylea trifolia L.
American Bladdernut is native perennial shrub growing up to 15 feet high, heavily branched due to suckering. 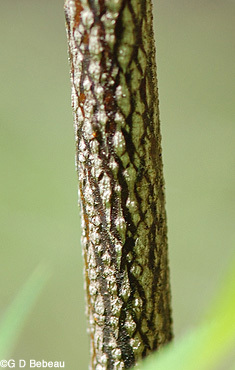 The bark on older stems is smooth, grayish-green to reddish, and somewhat striped with white furrows. Young twigs are green to reddish-brown with large brown buds that are ovoid in shape and have four scales. The pith of the twig is white. The leaves are opposite, pinnately compound with three ovate leaflets that are finely toothed, with obtuse bases and abruptly pointed tips. The two lateral leaflets usually do not have stalks, the terminal leaflet does. They are shiny and somewhat resemble poison ivy. 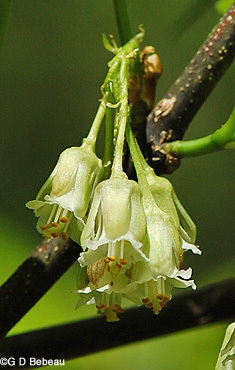 The inflorescence is a drooping raceme of stalked flowers, that is either terminal or rising from the upper leaf axils and appears at the same time as the leaves. 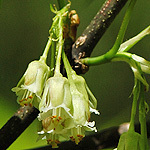 The Flowers have a small tubular calyx. The five outer sepals are spatula shaped, white to greenish-white to semi transparent, erect, with slightly incurved tips and slightly shorter the the five whitish inner petals which are the same shape but with tips that slightly spread outward. There are five stamens that alternate with the petals and have yellow-orange anthers. These and the four-parted style are slightly exserted from the corolla tube. Each stalked flower has a small bract at the base of the stalk. Stalks, which are longer than the calyx, and the calyx itself, are smooth and free from hair. Seed: The fertilized flowers quickly turn into a 2 to 3 inch long conspicuous 3-pointed inflated papery pod, within which matures from one to four 3-sided seeds, usually a single one within each cavity of the pod. Seeds are brown at maturity. 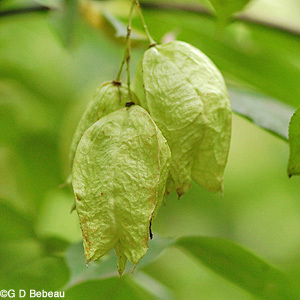 Habitat: Bladdernut grows in rich woodland areas and thickets where it receives at least partial shade to full shade. It tolerates a variety of soils but prefers moist soils. In the Woodland Garden they grow in several places, the larger specimens near Guidebook Station 12. Some also grow on the back path leading to the Upland Garden. They sucker easily and will form a thicket. 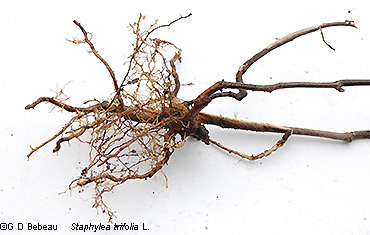 The woody root system has a main taproot with branching laterals. 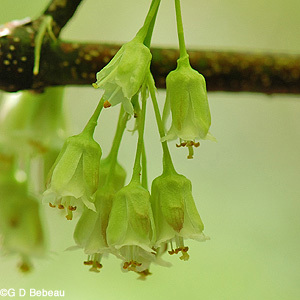 Names: The genus name, Staphylea, refers to 'a cluster' as in the arrangement of the flower cluster, from the Greek staphyle. The species name, trifolia, is from the Latin tri and folium and means 'leaves with 3-leaflets.' The author name for the plant classification 'L.' is for Carl Linnaeus (1707-1778), Swedish botanist and the developer of the binomial nomenclature of modern taxonomy. Comparisons: Bladdernut is somewhat unique being a shrub with 3-part leaves and the large inflated seed pods. The only other member of the genus, the Sierra Bladdernut, S. bolanderi, is similar but found only in the mountains of California. Above: The Bladdernut flowers in spring but it could be late April or early June, depending on the season's weather. 2nd photo The compound leaf has 3 leaflets with finely toothed margins. Above: - 1st photo - Early flower color of the sepals (right) is more greenish before turning white. 2nd photo - The flowers have bracted stalks (pedicels) that are slightly longer than the flower. The small bracts can be seen at the base of the stalks. Below: 1st photo - Twig buds are brownish with four scales. 2nd photo - The woody root system of a young plant - note the developing tap root. 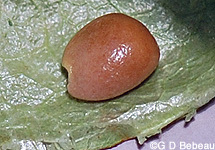 Below: Each chamber of the seed pod can have a brown 3-sided seed, but not all chambers will necessarily have a seed. Below: A thicket of Bladdernut on the West path of the Woodland Garden. 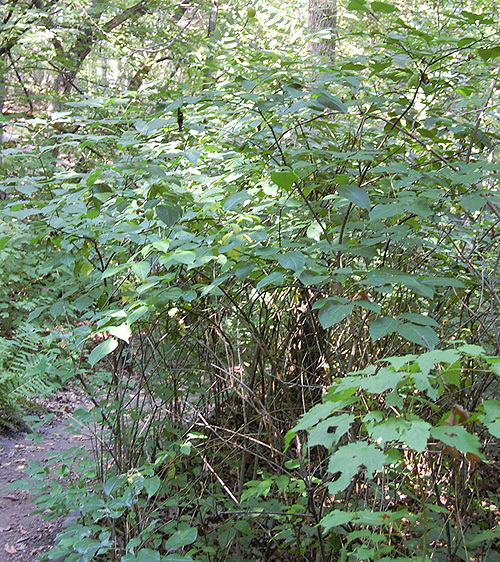 The plant has a loose structure typical of an understory shrub. 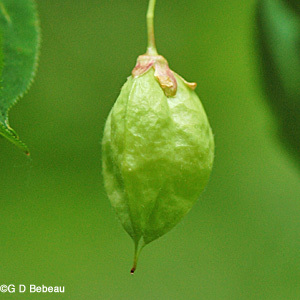 Notes: Eloise Butler noted introducing American Bladdernut to the Garden in 1907 from specimens obtained at Minnehaha Park (Minneapolis) and again in 1908, '12 and '19 from the same source. This plant was listed on Martha Crone's 1951 inventory of plants in the Garden at that time. A recent planting was in 2008. Bladdernut occurs natively in Minnesota in the South Central and SE counties only, from Wright and Anoka down to the SE corner, roughly following the Big Woods along the Mississippi and also in a few counties along the Minnesota River. Its range in North America is generally east of the Mississippi river and the Canadian provinces north of that area. 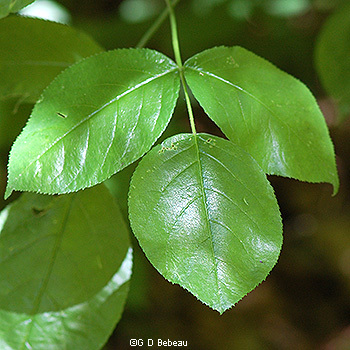 American Bladdernut is the only species of Staphylea and the only member of the Staphyleaceae family found in Minnesota and is only one of two species of Staphylea in North America.